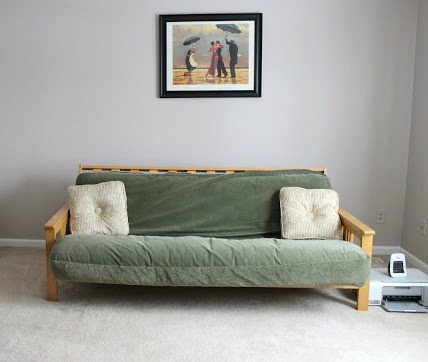 About a year ago I recall coming across an article of 15 things you should never have in your home after 30 and there taking the #1 spot is the not-so-all mighty futon. I admit until recently I was quite thee futon snob myself but when life hands you lemons....you squirt someone in the eye. No, just kidding....what I meant to say was when life hands you lemons, and that lemon is in the shape of a futon, you make lemonade. Many of you saw our made over futon in the playroom reveal but I never shared with you what it looked like before I got my hands on it. Ladies and gents, please hold your gasps while I present to you our green and ghastly ol' futon. Hurry! Someone please give me an antidepressant! Is this not the saddest piece of furniture you ever did see? But remember life, lemons, and lemonade? We acquired this futon about eight years ago when we moved into our first home. The prior owners left it behind like a neglected, little puppy. Being that we were young and incapable of furnishing a whole home right away, we accepted it with open arms. Most of our friends and family live out of state and up until a few years ago this served as a "guest bed". I know what you're thinking. "By golly! And people still like you?" They did, they just had to seek chiropractic treatment every time they came to visit. Fast forward to last summer, when we decided to move. I begrudgingly agreed to drag this thing along to our new home. Despite the fact that we now have an extremely comfortable bed for our guests, we at times have multiple people staying with us, especially during the holidays and they actually don't mind sleeping on the futon. 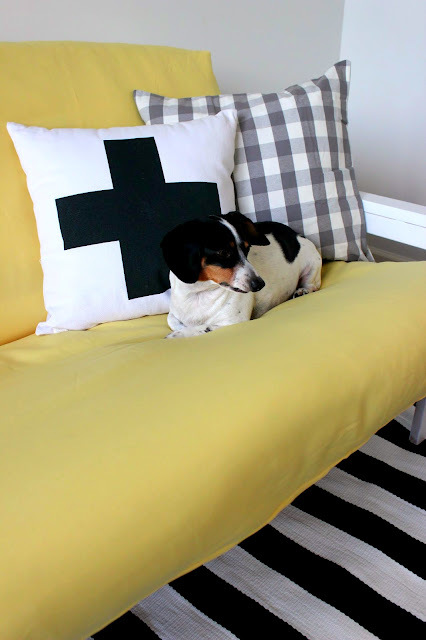 When it came time for the playroom makeover, some of you may recall my original inspiration for the space included a fun and bright yellow couch. Purchasing a new couch that could easily be destroyed in 2.5 seconds by 1.5 year old was out of the question. Luckily for me and this futon, I was able to breathe life back into it. I found the cover on Amazon. They have a whole slew of colors to choose from. I went with "Sunshine". The material is very soft, not like the canvas type of material most people are use to when they think of futon covers. I will warn you though it's a thin material and can easily snag around sharp objects, like say a dog's nail. Not like I know or anything. So see! A futon can thrive in an environment sans kegs and ramen noodles! Since we already had the paint on hand, the best part was that this project only cost us about $35. Not bad for something that provided both a functional and colorful impact to the room! *This post contains affiliate links, which means if you decide to make a purchase through my link, I will receive a small commission for it. This doesn’t cost you anything additional. This in no way affects my opinion on these products. Thanks for supporting my cheap wine habit. 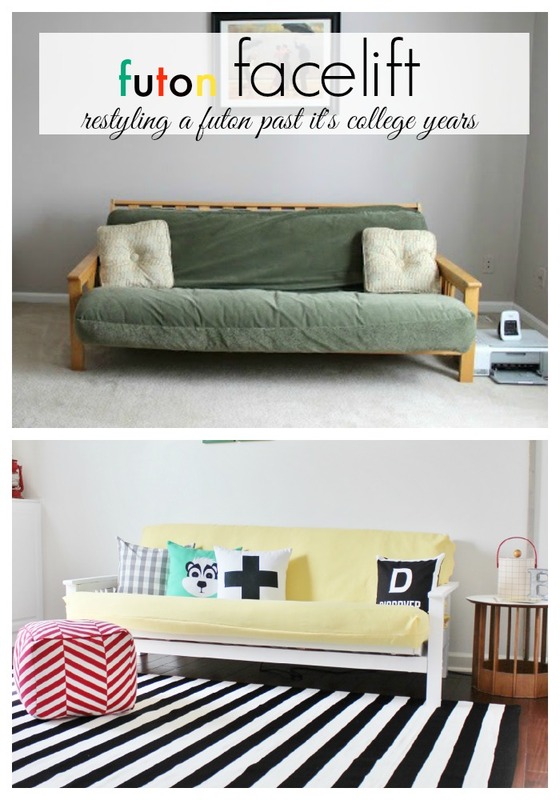 I just bought a second hand futon I am planning on painting white so I'm so glad I found this --yours turned out great! Also LOVE your throw pillows--where did you get those? !